Have you ever used a Bounce Dryer Bar? When I first saw them in the laundry aisle I didn't really pay attention to them. Could you really improve on a dryer sheet? But after getting a coupon in the mail for one I thought I would give it a try. This month is our two year anniversary. Why did I stick with the Bounce Dryer Bar? They did improve on the dryer sheet. They took all of the freshness, softness, and static control and made it even more convenient. I know you are thinking: "How hard is it to put a dryer sheet in the dryer?" I thought the same thing two years ago until I installed one. Before the Bounce Dryer Bar, I was notorious for throwing a load of laundry in the dryer, wondering if I had put a dryer sheet in yet, and tossing one in just to be safe. When I went to fold that laundry I found two used dryer sheets. I was wasting them left and right. It worked the other way too. If I didn't throw one in to be safe, there wasn't a dryer sheet in the dryer at all. So what I got for trying to be thrifty was a load of clingy laundry. I don't even have to think about dryer sheets anymore. Now every couple of months I slide in a new Bounce Dryer Bar. Just stick it and forget it. What my daughter doesn't know yet is that moving the laundry from the washer to the dryer is about to become one of her new chores. Isn't getting older fun?! I can guarantee if part of that job required remembering a dryer sheet I would have a lot of clingy laundry. You also don't have to worry about a dryer sheet popping out of the leg of your pants at work. That has actually never happened to me, but I saw it on a TV episode last week. Just another thing I don't have to worry about with my Bounce Dryer Bar. The bar is super simple to install and just as easy to replace. If you don't believe me, you can watch videos of them being installed and replaced on the Bounce Facebook Page. Be warned, the videos may make you want a cute orange dryer! If you haven't tried a Bounce Dryer Bar yet, now is your time. Leave a comment telling me why you are ready to give the bar a spin and you will be entered to win a Bounce Dryer Bar and a $50 Visa Gift Card. You have until Tuesday, 12/6/11 at 5:00 P.M. PST to enter. No duplicate comments. You may receive (2) total entries by selecting from the following entry methods: a) Leave a comment in response to the sweepstakes prompt on this post b) Tweet about this promotion and leave the URL to that tweet in a comment on this post c) Blog about this promotion and leave the URL to that post in a comment on this post d) For those with no Twitter or blog, read the official rules to learn about an alternate form of entry. This giveaway is open to US Residents age 18 or older. Winners will be selected via random draw, and will be notified by e-mail. You have 72 hours to get back to me, otherwise a new winner will be selected. The Official Rules are available here. For more opportunities to win, visit the Bounce round-up page on BlogHer.com to read other bloggers' reviews! *** This is a compensated review from BlogHer and Bounce. I was given a free Bounce Dryer Bar for review purposes, but all opinions in this post are my own. Seems like these would be better for the environment too - no waste from the dryer sheets, and no chemicals from fabric softener! I have the same problem with remembering if I put in a dryer sheet, I am ready for this super easy and fantastic new way to make sure my clothes come out static free, this would save me some money on dryer sheets and maybe a little bit of sanity always wondering if I put a dryer sheet in, thanks for the chance! With 4 kids I'm ALWAYS doing laundry and what drives me nuts are all the dryer sheets that end up on the floor after folding. Dryer sheets everywhere!! This product would eliminate that! Yay!! I would LOVE to try something new to spice up the laundry routine! I hate doing laundry. I do. Having one less step to deal with in the process? Priceless. :) Thanks for the chance! I would lOve this. With 3 two year olds and a 8 month old it's hard enough to remember to do the laundry! I'd love to try it because I'm always running out of dryer sheets. I'm willing to give it a whirl because I hate static, and I value your opinion! sounds great! i'd love to try it! I would like to give one of these a try, I hate dryer sheets because I hate that they are just something else that I have to throw away and fill up the landfill. I will give it a spin because dryer sheets are a pain. Either I'm out and have to race out to the store and get them, or they float out of my done laundry and the dogs shred them! Bounce bar me! These are awesome! I am constantly running out of dryer sheets. Another plus is I LOVE THE SMELL of BOUNCE!!!! I would love to try one!! First doing laundry is such a hassle with a family. I'm constantly running around with my head cut off and I ALWAYS seem to forget to put a dryer sheet into the dryer until the last minute when I hurry and just throw one in. This will make it easier on me and my boyfriend who when attempting to do laundry seems to mess something up or leave something out. And with a bounce dryer bar I will feel a little better knowing he wont need to worry about that! I like these for the same reason- don't have to thin abotu putting a dryer sheet in everytime, and less waste. Also, because our dogs have an affinity for eating dryer sheets. I like the bar overall, but did have trouble with our first one in that it cracked in pieces and got all in our laundry after a few weeks of use. I would love to try the bar, I hate finding the sheets floating around the house after they've fallen out of the laundry! I would love to try this! Thanks for the opportunity!! I would love this!! I am always forgetting the fabric softener!! it would be cool not to have to think about the dryer sheet or have to leave them out to remember etc. I looove my Bounce Bar. They are totally worth the money.....and so convenient! I hated having to add a dryer sheet to every load,not only was it a pain but it created unnecessary trash! And another bonus....NO STORAGE needed.....something I love! I love the dryer bar because it works so well and is very easy. It is one less thing I have to worry about. Thanks for the chance to enter. I'd LOVE to try this and see how it works :) Thanks for the give-away!! Am I too late? What time is it there? Well anywho, I'm ready to give it a try. If for no other reason than the fact that I get sick of used dryer sheets everywhere. Yes, I have that problem. Thanks! I've just started using homemade detergent and fabric softener, and it's working great - but I miss that yummy softener smell.. and also the static cling issue, I don't know if my new softener works for that yet since I just started using it.. so I would love to add this to my dryer to help boost the scent and the static cling issues!! I hate always having to buy dryer sheets. They get expensive! 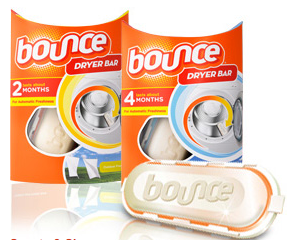 I definitely love the idea of the Bounce Dryer Bar...because I ALWAYS forget to add in the dryer sheet. One less thing to think of to make my laundry smell good sounds wonderful to me! I always forget to put the dryer sheet in. Perfet solution to my problem. A little of topic but I thought I'd share. I'd like a dryer bar because nothing is as icky as static when taking laundry out of the dryer! Thank you for the chance to win. I would love to start using these, but sadly we share a laundry room with the other people in our apartment building. Hopefully soon though! I'm ready to give the bar a spin cos I always forgot the fabric softener! I want my clothes to smell fresh every time! What a great invention! I've used the dryer bar previously. I do love it, except for a couple of things. #1 the adhesive doesn't hold up too well with the heat. #2 Because the adhesive doesn't hold up so well it falls off causing you clothes to become sticky from the melted adhesive. #3 The bar falls off before it's been 'spent' wasting money and rendering the bar useless. I'd love to try it! I do the same as you, wonder and then throw in an extra, or I round up all the ones on the floor and throw tem all in hoping for a second go. I am ready to try the Bounce Bar! It would be so nice to not worry about putting in dryer sheets! One less thing to have to remember!! I would love to try the bounce dryer bar so I don't have to keep buying dryer sheets and I can stop forgetting to put them in! i would love not to have to use dryer sheets anymore! I hate static as much as the next person but I still forget the dryer sheet all the time. Like that won't forget to put the softener into the dryer. I always forget the the fabric softener everytime so this would be perfect! Anything that makes laundry easier, even as simple as not having to use dryer sheets every time Is worth trying out. I love ANY product that saves me time and helps me multitask! Plus I have heard these are awesome! I'm ready b/c it would make my life easier. I like that there would be less waste! I'd love to give it a try so I won't be worry about bringing dryer sheets. I would love the Bounce Dryer Bar because I would not have to worry about throwing a sheet in every time (yes I forget a lot lol). Hmmm, now where did I put the fabric sheets. I know they are in here somewhere. I remember putting them on top of the laundry detergent. Alex.. has the dog been in my laundry room again? Leo.... why do you think the fabric sheets are to play with.. now they are all over the garage.. <-- This is why I would love to try these. Put them in the dryer and Leo can't make one more mess!! I remember when laundry became one of my chores. I used to hate it because I forgot to put a dryer sheet in. I've seen the commercials but never thought that it actually worked. Sounds like a great item and I think I'll get one the next time I'm at the supermarket. Thanks for the review and chance to win. I really hate doing laundry and having to find/throw away the dryer sheet. This would absolutely rock! Bounce is the Mercedes of fabric softeners! Laundry is my LEAST favorite chore & the Bounce Dryer Bar would make it a little easier! I would love to try one of these! I've only heard good things and I love to try new stuff. Anything that makes life easier is for me! Anything that makes laundry time easier is welcome! I would love to give the bar a spin because it lasts for 3 months and seems more cost effective. Dryer sheets can be costly. This bar looks so much easier. I had how the dryer sheets stick to everything. It would be nice to not have to worry about putting in a sheet everytime I do wash. I have used these and I love them! I'm all about one less thing to remember! Can't wait to try it. Sounds like a great product. I would love to try it. Thanks! I'm kind of forgetful when I'm doing housework, so I'm always realizing that I missed putting in a dryer sheet in a load of laundry. This would eliminate that one issue and would make my life a tad easier! :) Thanks for this great giveaway. I don't mind dryer sheets, until I am folding my laundry and they pop out of the basket wherever I am (living room, bedroom) nowhere near a garbage can. So, of course I set it down somewhere near me, forgetting to throw it out. And then hours later I look down to find my infant sucking on it. A dryer bar would be marvelous! I LOVE my bounce dryer I hate have the dryer sheets everywhere. I am a bounce dryer bar fan and will be forever. if you have ever had a random dryer sheet show up in your outfit in the middle of the day and then felt the need to out yourself just in case anyone saw it before you did... ok I am talking about me:)This sounds like a product for me! I'm ready to try because I can never remember to use a dryer sheet! I have been so hooked on dryer sheets all of these years. Why didn't I think of that? Will have to try it out. Thanks! I've never seen one of these. I still use the regular Bounce sheets and run out at the worst time. Whether I win or not, I'll definitely be trying this. Thanks for the opportunity. I would love to try this especially since i almost always forget to put a dryer sheet in and have to return to the dryer once i remember!!! I'd give it a try because it would be nice to not have to wonder if I put that sheet in each load! i am all for anything that makes doing chores easier. I live with and do the laundry for 3 boys....I can't believe how bad their laundry smells and that is what I hate the most. I would love to try this new product. Sounds great! I'm definitely ready to give the Bounce Dryer bar a spin! Laundry is one of my most dreaded chores so anything that will help make it easier is a plus for me! I have the same problem of not knowing whether I have put a dryer sheet in. I always end up with two! Would love to try this. I would love to try this? I never remember to put in the dryer sheets! I tried it when it first came out and loved it, but the store I normally go to doesn't carry it, so I have forgotten to look elsewhere! Thanks for the reminder!! great giveaway! I would love to try it. I'm always forgetting to add the dryer sheets to the load. Great for a uberbusy mom of 4 boys!! Thanks! I have never used one because I thought it could melt and get the clothes all goopy or stain some jeans or something. I would like to try it...if it won't ruin my clothes. I have in fact found stray dryer sheets peeking out of pants legs so this would be great...no more hide-and-seek-the-sheet! Many thanks...have a cheery day! I hate using dryer sheets because they end up stuck in the clothing or falling onto the laundry room floor. The dryer bar would be much more convenient. I tend to forgot to add sheet and the liquid fabric softner wants to gum up the dispenser, no more lugging the bottles each time I need to pour a capful.. I am ready to change. So that the day after laundry day, when I am putting on my clean underwear, I do not find a dry sheet in it! Hey I am a busy mom and that is quite uncomfortable!! Yea, Laundry is a pain, but this would make it easier I think.... and could always use the gift card too! Thanks for a chance. The dryer bars are intriguing. I'd love the chance to try one for free! I am ready because I HATE static cling!!! i get tired pulling all of those used dryer sheets out of the clothes basket when my teen doesn't/won't throw them away! I would love to try the bar because I am always forgetting to put in the dryer sheet! I'm ready to give the bar a spin because I hate dryer sheets - they always end up on the floor, I've slipped on them more than once (we have tile floors). One day I just know I'm going to fall and really hurt myself! Oh man this would save me lots of time! I'm so ready! I'm ready to give the Bounce bar a spin because the time I save can be spent doing other things! I am ready to give the bar a spin because I sometimes forgot whether I'v put the Bounce dryer sheets or not after I started the dryer. Looks interesting....I would love to give it a try. I am ready to give this a try because I either forget to put in the dryer sheet or I find them stuck to a piece of clothing when I am out in public. It is not something you want to do is walk down the street with a dryer sheet stuck to your sweater. Hope this will cure that problem. I also would like it because I always forget to add the fabric softener and so on. I love that you put one in and that's it! No more worrying about dryer sheets or liquid fabric softener for weeks! I am like you and often forget to put the sheet in or end up putting in two because I am unsure. I'd like to get rid of dryer sheets. I always forget the dryer sheets; this would be great to try. This dryer bar would be fantastic--no more getting the sheets and looking for them.